EDGE :: Amphibian Species Information. ARKive – Cave salamander videos, photos and facts – Proteus anguinus. Creeped out by it? Cool. Cause I want one. 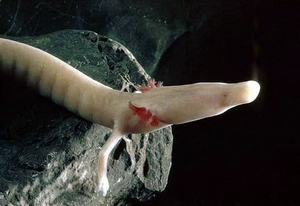 The olm is a Europe’s only cave adapted vertebrate, and has numerous adaptations for an underground life. Olms hunt their prey in the absolute dark and have developed a powerful sensory system of smell, taste, hearing and electrosensitivity. Olms are pale and sightless, although their skin-covered eyes are still light sensitive. They are an entirely aquatic species that can survive without food for up to 10 years and live to an age of 58 or more. Part of an ancient lineage of amphibians evolving independently for 190 million years, this species is now threatened by pollution and habitat disturbance. A small subpopulation of “black olms” may be a separate species requiring additional protection. They can be found in the caves of Bosnia, Herzegovina, Croatia, Slovenia, Italy and possibly Montenegro and Serbia. Olms are a pinkish color due to their capillaries near their skin and their translucency allows you to see the colors of their organs. Aside from being called Cave Salamanders, they have also been dubbed “human fish”, since someone stranger than myself thought they resembled a small human. Adult Olms develop lungs in addition to the gill tufts on the sides of their heads. This entry was posted in Alphabet Challenge, Amphibians and tagged ARKive, IUCN Red List, Lissamphibia, Olm. Bookmark the permalink.